Looking for ideas on things to see and do in the Yorkshire Dales. Our experts have experienced the delights of the Yorkshire Dales National Park direct and have come up with this list of recommended things to do whilst enjoying a cottage holiday in this beautiful English' park. Go walking, exploring, bird watching or sightseeing. There is so much to do for a relaxing holiday or weekend break in the Yorkshire Dales. The scenery will appeal to photographers and artists - there are plenty of gorges, crags, caves, waterfalls and rivers for scenic images. Summer encourages numerous visitors glorying in the wild flowers and later, swathes of pink heather in bloom on the hillsides. Some of the rivers in the Yorkshire Dales, such as the River Wharfe are shallow in parts, just perfect for children to paddle in. No childhood is complete without the memory of paddling in the icy cold clear waters of a rock strewn shallow river. As long as you’re warmly dressed, the winter can be a good time to visit the Yorkshire Dales because you can enjoy them in peace and solitude, and get that feeling of being one with nature. For family fun, Diggerland Yorkshire makes for a great day out near the Yorkshire Dales. Situated close to Castleford in West Yorkshire, discounts are available online for advanced bookings. At this park rides are inspired by JCBs and diggers and for a fun day out this is an excellent place to go. Rides and experiences include Giant Diggers, Dirt Diggers, a Diggerland Train, Diggerland Tractors, Dodgems and Mini Landrovers for younger visitors. For those who want the unique experience of driving a real digger and for adventure park fun, Diggerland is highly recommended. The birdwatching is superb at any time of year. Click the page below to view a list of birds that you may see in the Yorkshire Dales depending on time of year and location in the Dales. Walking is the most popular pastime in the Yorkshire Dales. It's the peace and quiet, the opportunity of getting the heart beating as you struggle to get to the top of a hill to be rewarded by the view. There are several documented walks or ways such the 'Coast to Coast' , 'Dales Way' or Pennine Way that cross the Dales. It's always possible to attempt part of these long distance walks if you cannot manage the complete one. 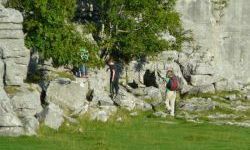 For the less fit who enjoy a shortish walk on the level, there is a selection of less demanding walks in various parts of the Dales such as the 'Crackpots Mosaic Walk' in Nidderdale and numerous circular walks. 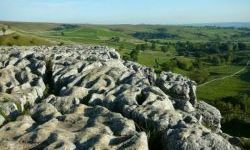 The dales are a natural outdoor playground - quiet enough for cycling and the terrain is suited to many sports such as caving and potholing.